Damn near everything in the rig got used on this one except for Plaits. That is a massive set-up in the background behind that giant sushi roll! Sounds like waves and wind chimes with hum of life on a summer day. Very cool! TY! That was kinda what I was after, so this is pretty perfect! [quote=NWSPR]That is a massive set-up in the background behind that giant sushi roll! Sounds like waves and wind chimes with hum of life on a summer day. Very cool! [/quote] TY! That was kinda what I was after, so this is pretty perfect! I completely forgot what I was doing as I got lost in a daydream listening to this wonderful track, thanks for the trip! Well great, now I just want sushi. Well great, now I just want sushi. Great atmosphere. It's real great! I am changing it up again for this week's beat, we'll see if the change is for the better. Thanks! I'm so happy! I ended up putting it on Spotify et al as "Ding Dongs" because I'm a child. 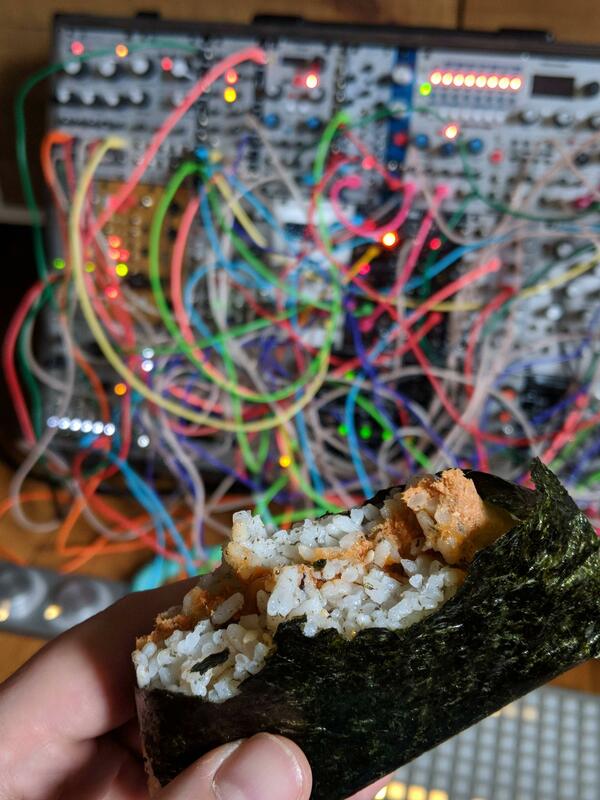 Same yo, but Onigiri is diffrunt. TY for the listen and the nice words! [quote=hieme]That setup looks mental :o You absolutely nailed the summer airy vibe my man, one of my absolute favourite sound worlds <3 This is like sitting on a grassy hill in the breeze while cumulus towers rise and fall on the horizon <3 Got chills listening to this, phenomenal stuff <3 <3[/quote] It's real great! I am changing it up again for this week's beat, we'll see if the change is for the better. Thanks! [quote=Gab Manette]I completely forgot what I was doing as I got lost in a daydream listening to this wonderful track, thanks for the trip! [/quote] I'm so happy! I ended up putting it on Spotify et al as "Ding Dongs" because I'm a child. [quote=Devieus]Well great, now I just want sushi. Great atmosphere. [/quote] Same yo, but Onigiri is diffrunt. TY for the listen and the nice words! Right you are, though I've never had one of those, so I wouldn't know if I wanted one.